Gold OA & Gold OA (waived) Journals Journals in which all peer reviewed scholarly articles are online available without any restrictions and for which an Article Processing Charge (APC) has been paid. Subsidized Journals Journals which do not charge an Article Processing Charge (APC) and are instead subsidized by other means (including university / government / agency / corporate sponsorship / print subscriptions / advertising). Hybrid OA Journals Subscription-based journals that offer an APC-based OA option. Delayed Hybrid OA Journals Subscription-based journals which provide free online access upon the expiry of an embargo period following the initial article publication date. Subscription Journals Journals which cover publication costs through access tolls such a subscription costs. Scopus updates the OA journal list (part of the Scopus Title list) three to four times a year. This time lapse may lead to minor and temporary discrepancies in the OA journal status on Scopus.com. 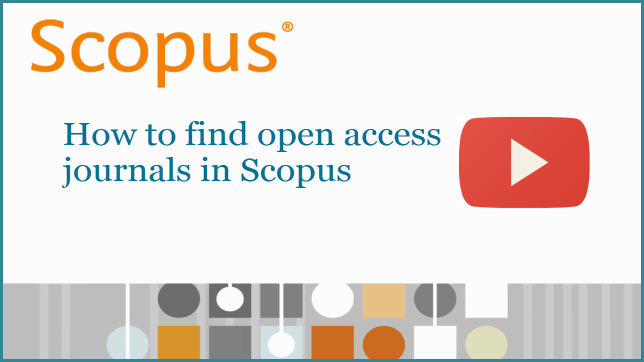 You can find more information on Scopus content at the Scopus info site. Read the full release notes for more information on the Open Access indicator and the newly launched Article Metrics Module. Follow us on Twitter for timely updates or email us.